Progressive Training is what you want to be doing, if your workouts aren’t progressively getting more difficult as you develop, then you will hit a plateau. Calisthenics is no different. So your workouts need to get harder. Now the great thing about calisthenics is that there is a natural progressive element brought in for skill development - Literally Progression Exercises! - but when you aren’t working on a new skill, what options do you have? With weight training it is easy, when you can do your weight you simply slap some more on, until that gets easy and you add more again. With Bodyweight training it is more fun and interesting than that, but you still need to remember to do it. Check out the MoreThanLifting Podcast Episode where I go deep into progressive bodyweight training. So Variations are the secret! When you get competent at an exercise, you unlock the ability to try all of these new variations of that exercise. There are more variations for some exercises (like push ups) than others, but you can basically get as creative as you want! There is a set of groups of variations that can be applied to multiple exercises (but not all) and I call these Common Variations. One arm variations are exactly what they sound like, instead of both arms you do your reps using only one - do both sides though to keep balanced! Archer Variations are when you do reps with one arm straight, this is like a mid way point between one arm and regular 2 arm exercises, but you get the added bonus of building straight arm strength on the other arm. Typewriter variations are simple exercises where you get to the top (or bottom) of your rep and then transfer your movement side to side. Typewriter push ups, pull ups, etc are all great examples. Plyometric Training is reactive and explosive. Plyometric variations are often extended Rang Of Motion beyond the range of your anatomy. Things like jump squats, clap pull ups and Superman Push Ups. Check Out The Podcast Episode On The 5 Common Exercise Variations for more information! Check out the Podcast on the 3 Types of Exercise Variations for more information and how to fit them into your training. These are basic variations, the first group you unlock after you master an exercise. The reps usually stay the same, the basic movement is the same, but the changes in grip or position will change the dynamic of the exercise slightly. Complex variations are more advanced than Simple Variations and change the dynamic of the exercise by changing the movement slightly. Complex Variations are sometimes extended movements, like Russian Dips, and sometimes they are changes to the movement, things like Archer Pulls and Typewriters. Technical variations are a whole new thing. These often take the exercise and mash it up with something completely different making it almost unrecognizable to the original exercise. You combine different skills to make Technical variations, L Sit Pull and Handstand Push Ups, for example. These are more than complex and take specific training to be able to achieve. Korean Typewriter Dips are a great example - and really look nothing like dips! So as you expand out from the realms of the basic variations it gets more advanced and ultimately more difficult. But you want to learn something new? A Skill? You want to advance to the next level? Once you get good at your rows you can hit that Level 1 good, you unlock all of those Level 1 Variations. But how do you get to level 2? You get there with Progression Exercises. Progression exercises are regressive and simpler variations of an exercise. Direct progressions create a series of exercise variations that take you from very simple up to the full version of the exercise. This is the shortest form of the lever, instead of having our legs out straight, you bring them right into your body, making the exercise a lot easier. Advanced Tuck is the next stage, where you untuck your knees from your chest and start straightening out your back. Single Leg Progressions leave one leg tucked up into your chest, and the other one gets extended straight out. This is easier than a straddle but harder than an Advanced Tuck because it makes one side of your body hold the Full Version of the lever. Straddle is a gymnastics term that refers to you having split legs. Spread them as wide as you can, because the wider they are, the shorter the lever (across the length of your body. The last step is Straight Leg, this is the full lever with your legs together, and the last stage of your progression. When you get here, you are doing the skill, be it a planche front lever or flag. So if you are learning a planche or a back lever, you can apply these variations to your chosen lever and work from the shortest and easiest (tuck) down to the full Straight Leg levers at the end. Dynamic skills like muscle ups and pull ups have different progressions, usually involving a tool to lessen the resistance. Negatives are when you do the 'down' part of the rep, you hold on tight and let gravity do the work. Negatives are great for dynamic skills because you are doing the easiest part of the movement, but it is the full Range Of Motion and unsupported. Great for working on your form! Mini Reps are where you just sit in the middle of the rep, don't go all of the way up, don't go all of the way down. Instead sit in the middle and just try and work within the rep.
Mini reps are often done fast as burners or finishers. But they should be used as a tool for progression and not as an excuse for Bad Reps, because they are bad reps after all! Kip variations are using a little swing or momentum to get through your reps.
Often used for Pull Ups and Muscle Ups, it is naughty, but when you are learning, you've just got to get reps in and this can be a great way to do it. Resistance bands are a great training tool. They can provide assistance with reps, and you don't need a training partner! Great for Muscle Ups and Pulls and even some levers, they can help support your body whilst enabling you to push out the reps.
Lastly we have assisted reps. Get your training partner to hold your feet and lift with you for those muscle ups. You will still do most of the work, but this will help you with the little transitions and weak points in your reps, so you can hit that 10 mark even if you cant do them unassisted. Just the same with all of the other progressive training above, you start with the easiest and move on to harder and harder ones until eventually you can do the full Pull Up or Muscle Up. How Does This Turn Into A Training Program? At first, you want to figure out where you are. What is your starting point? Can you do pulls, can you do leg raises? 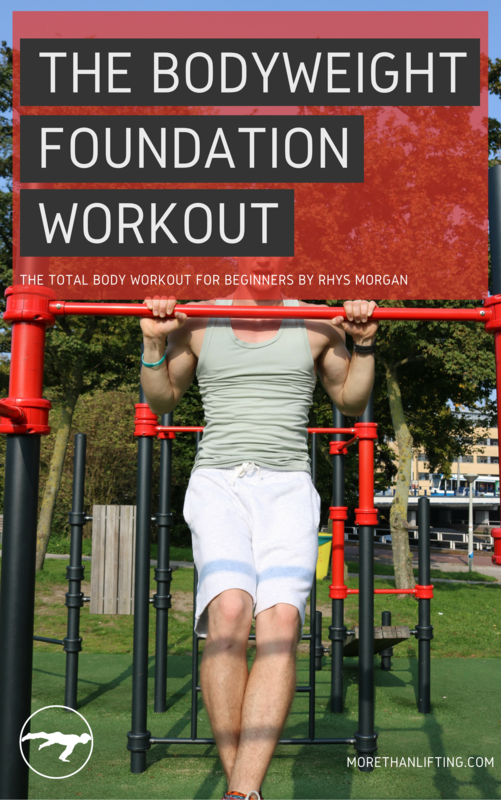 I’d recommend starting with the Bodyweight Foundation Workout because that will build the foundation of strength needed to tackle more advanced skills. This is your starting point. This also becomes a template for your training, let me show you how this works. So you download the workout and you can’t do pull ups? Not a problem, switch out those pull ups for a pull up progression exercise that matches you level - like Negative Pull Ups. As you get better at the negatives, you will eventually be able to switch back to regular pull ups as you get stronger. But, even as you are building those pull up progressions, you will quickly get competent at the bodyweight rows, the Level 1 Pull Exercise. So instead of doing the same boring rows every time, start exploring the variations. Maybe try simple grip changes at first, like wide grip. Then as you get good at them try typewriter or archer rows, then eventually one arm rows! You could be doing archer rows and Negative pulls in the same workout, as you progress towards full pull ups. Then once you get strong enough for pull ups, you can start trying more advanced Pull Up Variations, and eventually Muscle Up Progressions. So the programming essentially creates itself as you start unlocking these new variations and develop the strength to tackle the progression exercises for the next level. This will depend on where you start, but you can also start mixing in Isometric skills like Crowstands as you work towards the handstand and planche. All it takes is for you to keep training and you will build over time. Provided you are putting the work in and following these basic progression templates, the sky is the limit. All you need to do is follow the progressions and you will be able to Planche, Handstand Push Up, Flag or Muscle Up. It just takes a little dedication and a little grit.